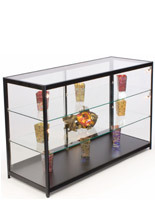 Extra-vision jewelry counters utilize a full 35" of showcase height! (2) Adjustable shelves accommodate items of varying heights! Counters feature full-panel locking doors to offer easy access to authorized individuals only! Ships fully assembled for quick store setup! 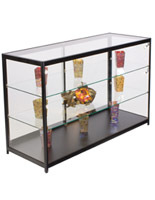 These 5' jewelry counters offer a safe place to both store and display articles of value! 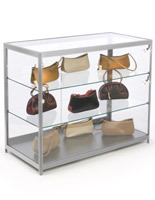 The retail fixtures have simple styling, leaving the spotlight on items inside the cases. 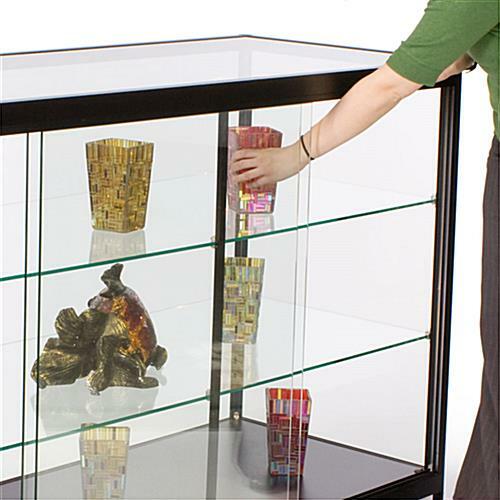 Jewelry counters that stand 38" tall, also known as glass cabinets, are perfect for retailers, but can also be found in museums, business lobbies or even schools. 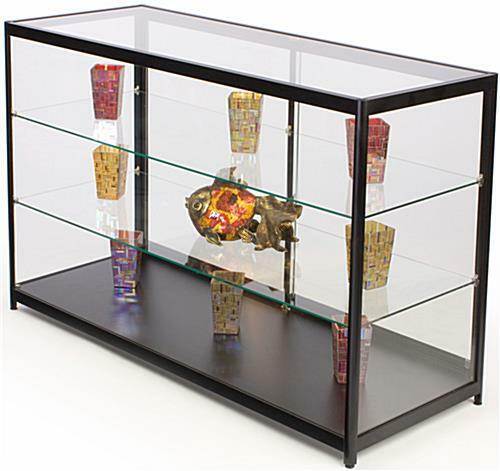 Any location that is looking for an affordable, easy-to-use and neutrally-styled means of showcasing artifacts, collectibles, fine china, sports memorabilia and more, will find this display very useful! 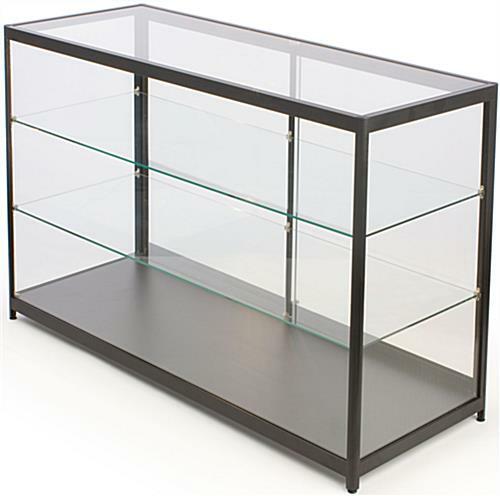 These store fixtures, jewelry counters that are in stock are built from quality materials, creating a case that will last for many years to come! 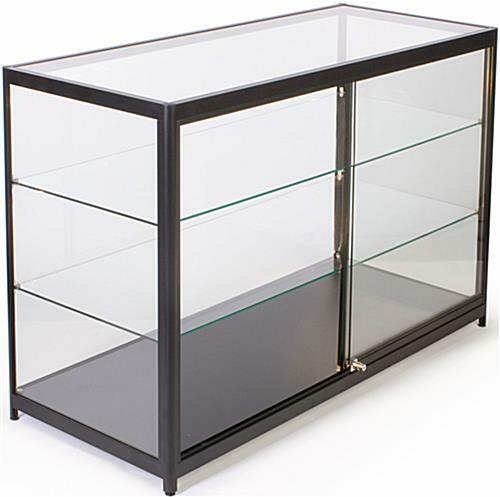 Black powder-coated aluminum extrusions provide the framework for tempered glass panels. 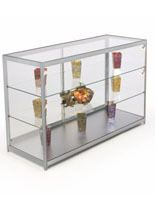 The jewelry counters attract attention, even without inside lighting! Adjustable floor levelers ensure the cases are stable on virtually any surface. The cabinets include full-height, half-width rear doors with a plunger lock. This allows employees to easily retrieve an item that a customer may be interested in. 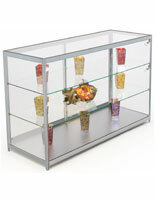 This unit is part of a full line of counter displays. The Essentials Line offers retailers a centralized area to display merchandise and encourage customer/associate interaction, which can often increase sales. 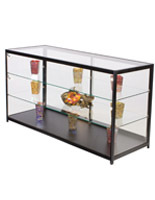 Users can purchase multiple pieces of this line to create an entire configuration! There are even many styles available with interior lighting! 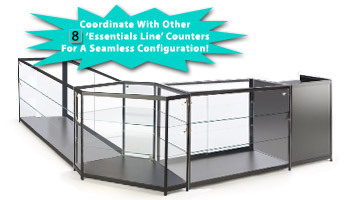 All Essentials Line cabinets ship fully assembled for your convenience!